This post is in response to a comment on a thread by Ogremasch (https://artemis.forumchitchat.com/post/update-dmx-basics-guide-9994591?pid=1307071430). Ogremasch noted that a lot of hardware with guides in the forum is hard to find commercially, if at all. My own experience with an off-the-shelf DMX-USB interface was less than stellar. Artemis needs an FTDI chip for the USB interface if using the DMX output that comes directly from the game. That also limits the choices. Some hardware sold with FTDI chips are using counterfeit chips, which don't always work. Looking at what the USB interface does, and noting people's preference for an RJ45 jack, I have sketched up the following interface design. It needs some testing, but should be up to the task. The design is based on my experience building circuits to read the DMX output from Artemis. I also have the parts on-hand, so I am thinking about building one to see how it works. I would be interested in testing it out if you make a spare one, let me know and I'll paypal you for the time and materials. If I am reading this correctly, this would be a single box that takes USB and Power and gives the user DMX out through RJ45 right? I am not great at reading schematics (yet). Is there a distance limitation to using RJ45 ( I know that ethernet cables can ony be about 300 feet long for internet use and the max effective length of USB is about 16 feet, I am not sure if DMX has a similar limitation. the likely hood of having a 300 foot cable run is likely very small but I wanted to ask since I am new to the DMX stuff and you have experience with it. I have also heard of people in the Forums having trouble with their DMX that may be linked to the USB being too long. 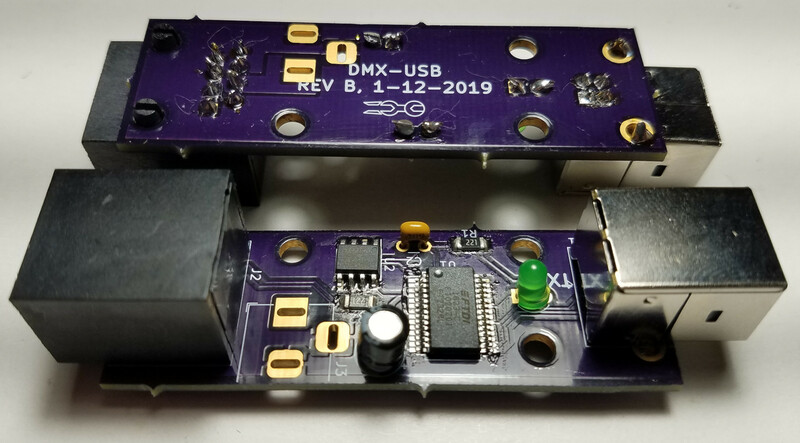 I have limited my DMX USB cable to 3 feet to avoid that problem which means I will need to apply the length to the DMX side of the board which leads me to needing to know if there is a max limit my server PC can be away from my bridge and still effectively control lights with relatively little or no perceivable lag. I look forward seeing more in this thread as the project develops. I plan to make one in the near future. I'll let you know how it goes. 300 feet sounds about right. Because DMX uses RS485 protocol, which is a differential pair for signal, typically in twisted pair wire (such as cat 5 cable), it can go longer than any of us are likely to use up. As far as I can tell, it doesn't generate a lot of errors. USB has a pretty short length limitation as you noted. Shorter is better. Otherwise, boosters are needed. PCB arrived today. Assembly was a breeze and the new interface works beautifully. I loaded up Artemis using the default DMX commands. The DMX controller and LED strip that Thom and Mark gave me at Armada III (DMX workshop - highly recommended!) worked perfectly. 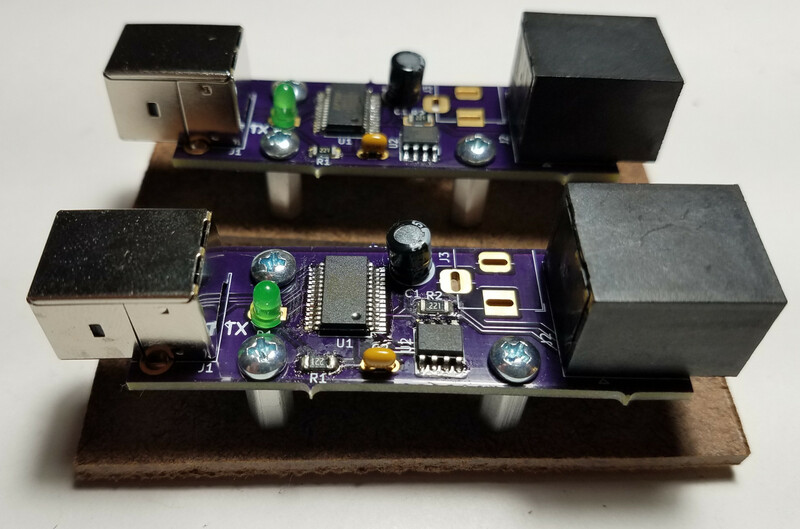 This should be a great, easy to make project for a lot of people to get cranking with some DMX for low money, and not a Ton of learning needed. I think its a huge contribution to the community, so thank you! I will definitely take some extensive video this time. I swear!!!! I now have three USB-to-DMX interfaces that are built and tested with Artemis. I am very happy with the performance of these custom-built interfaces. Doing some searching online, it looks like all the commercially-available DMX decoders (i.e., the box you need to plug the LEDs into), have the power supply attached with something other than the RJ45 jack (i.e., ethernet cable). 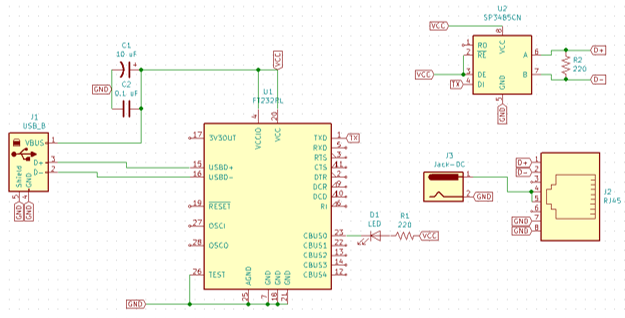 Therefore, having the power jack on this board only benefits people who can make their own decoder boards, which entirely defeats the purpose of me making them. Therefore, the power jack is out of the final design. I am currently looking at shipping to points in the US. I am including a no-frills pressboard base to help with mounting and setting up your own enclosure to protect the board (handling bare electronics can fry them). Why would anyone want these when there are cheaper interfaces for sale? Ethernet jack is built in and wired to work with popular DMX decoders -- less wires for someone to figure out. I tested each of them with Artemis and they work. Would you sell just the parts without assembly? And if so how much would it be? Without assembly, the parts and shipping cost are $15.80. 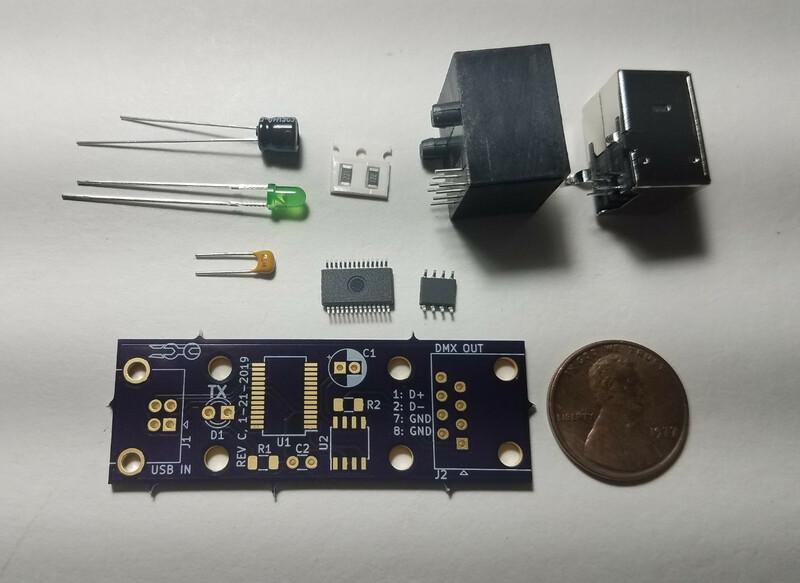 That assumes that the buyer is comfortable soldering all the parts on, including the SSOP28, which is not a beginner task. See photo below for the parts and a penny for scale. Because I will not be able to test everything prior to shipment, the buyer would need to assume all risk. I have no control over what happens during someone else's assembly. Therefore, I would advise against buying parts only. Send me a PM if you are still interested.